In the late 1970s, the Mashpee Indian tribe stunned the residents of Cape Cod by filing a lawsuit claiming ownership of all land within the borders of the town of Mashpee. The lawsuit was eventually thrown out on a legal technicality, but not before the town became bitterly and bloodily divided. A generation later, in Blood of the Tribe, the chance discovery of some 19th century historical documents paves the way for the lawsuit to be re-filed. Unfortunately for both the townspeople and the tribe members, the documents have been found by Rex Griffin, the one person in town who is both uniquely qualified and perfectly willing to play one side against the other in hopes of himself walking away with a large chunk of the $2 billion in real estate now in play. 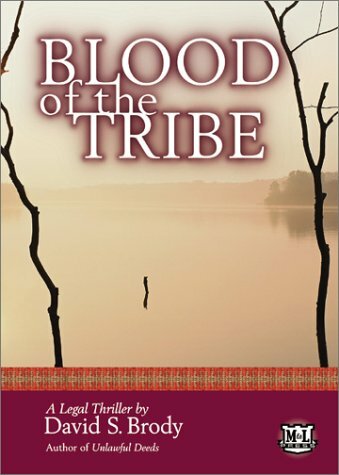 When Griffin is savagely run down by a hit and run driver and left to die in a ditch, everyone assumes that the townspeople and the tribe will be able to forge a compromise and avoid re-fracturing the town. Instead, Griffin—from the grave—continues to act as a puppeteer, foiling any possibility of settlement and forcing the sides into both a high-stakes legal battle and bloody town-wide feud that can’t end until the mystery of who murdered Griffin is solved.